This Virgin Islands restaurant guide, was put together for those of you who enjoy a good meal, and aren't afraid to pay a little extra for that luxury. Not every place on this list is expensive, however you will end up spending a few more dollars here then you would on anything on the cheap restaurants list. I love to eat out, I consider it an experience. Stepping into a restaurant and enjoying the fresh smells coming from the kitchen, along with the atmosphere of the place is something to behold. Like I've said before, I don't consider it a good vacation unless I gain about five pounds in the process. So that's why I feel like I'm so qualified to give you this review. Eclipse- Is located on the East End overlooking Fat Hog's Bay. You can enjoy the ocean breezes while dining on the creations like duck breast, mesquite grilled swordfish, or my favorite Filet Cambozola. I like this place quite a bit, it's one of the better Virgin Islands restaurants for sure. The Captain's Table- Located on Wickham's Cay this is a seafood lovers paradise. Try not to fall in the lobster pool here (it's right in the middle of the dining room). This popular restaurant features amazing seafood as well as veal, pastas, and some pretty good chicken. Spaghetti Junction- Has good food (I like the Lobster Thermidor), but it's more of a famous nightlife hangout. The sailing crowd loves to hang out at the Bat Cave, which is the a section right off of the bar. Spaghetti Junction is located just a few minutes East of Road Town. Brandywine Bay Restaurant- Cannot be missed! I absolutely love this place, they are famous for their homemade fresh mozzarella. The wine list is excellent, and some other favorites include David's roasted duck with mango sauce. If you're in the mood for something out of the ordinary try the ostrich. Make sure to get your reservations early this candlelit retreat does sell out for the evening. 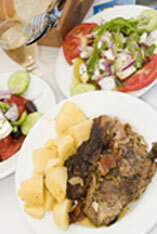 The Dove- Located on Waterfront Street in Road Town, The Dove is a cozy yet upscale restaurant. Reservations are a must, because of the popularity. Some of the better things on the menu include peppercorn crusted tuna, grilled wild boar sausage, and honey and sesame peking duck. C&F Restaurant- Has some of the best Indian food of an of the Virgin Islands restaurants. Located just outside Road Town the decor is supercasual, but the food is excellent (and chef Clarence gives you plenty of food if you want to share). Conch fritters, swordfish, and tasty lobster dishes have never dissappointed me yet. Tamarind Club- Is off-the-beaten-path but overlooks beautiful Josiah's Bay. They are open for brunch and dinner, but get reservations or you'll have to scavenge the beach for food. The rack of lamb and mahi mahi baked in banana leaves are both mouth-watering. I like to finish it off with the toasted coconut ice cream pie with pineapple carmel rum sauce. The Pasta House- Set atop a centuries old sugar mill this is a favorite of mine. There are many seafood/pasta combos that are out of this world. The Pasta House is located at Long Bay Beach Resort, but it's only open two nights a week so make sure to get reservations before you come to Tortola. The Palm Terrace- Is also located at the Long Bay Beach Resort, but it's only open seasonally (and again reservations are a good idea). Along with enjoying the candlelit tables and the ocean breezes make sure to take in the cornish game hen. Possibly the best Virgin Islands restaurant, the Sugar Mill is at the top of the class! The Sugar Mill- I've decided to save the best for last. The Sugar Mill is so good it was voted one of the four best restaurants in the Caribbean by a well know travel magazine (get reservations, they are closed Aug-Sept). Located on Apple Bay this 360 year old renovated sugar mill has a history to go along with its amazing cuisine and 5 star service. Popular entrees include pumpkin and black bean lasagna, pan-roasted quail, and filet mignon drizzled with an herb cream sauce. 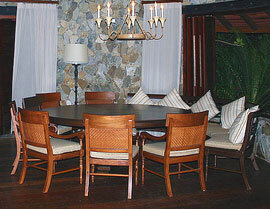 If I had only one meal to eat on Tortola this would be the place I would come! That's about it for the Virgin Islands restaurant guide. It's true that there are some pretty good restaurants that may not be on this list. I only get to try a handful of places each time I go to the island. This list will grow over time, so make sure to check back here to find some of the newer restaurants being added to the list.